The Bahamas is one of the world’s top tropical destinations. Located in the Caribbean Sea, this exquisite archipelago is made up of a string of islands, each more beautiful than the last. 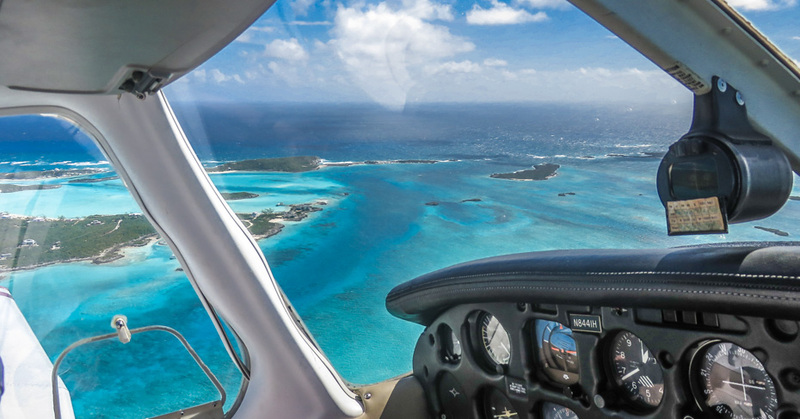 Island Hopping Bahamas by plane is the most efficient and picturesque way to explore this magnificent destination, especially with over 700 islands to explore. While many people now about New Providence Island and the city of Nassau on its coast, which serves as a gateway for island hopping in the Bahamas, this country has a far more appealing string of islands to visit. Known as the Out Islands, these pristine islands set the standard for the ultimate tropical getaway. With everything from yachting, snorkelling and scuba diving to discovering exotic animals and treating yourself to the local delicacies, an Island Hopping Bahamas tour of the Out Islands with Bahamas Air Tours is an experience that you will never forget. Until now, there has never been an airline dedicated to exploring the Bahamas. Bahamas Air Tours gives you the unique chance to soar through the clear Bahamian skies while looking down on the picturesque scene below you. Island Hopping Bahamas by plane is incredible because of the perspective you get on each island before you even land on it. The view of glittering coastlines bordering verdant islands all surrounded by an ocean that ranges through every shade of blue is a sight that you will never forget. The Schooner Cays of the Bahamas are a perfect example of why island hopping in Bahamas is such a fantastic experience. Astronauts have described the Bahamas as “the most beautiful place on earth viewed from space”, and it’s certainly clear why when you get an aerial view of Schooner Cays on your Bahamas air charter. While this area may not be a single island, the Schooner Cays is made up of several elongated sand banks with shallow turquoise lanes of water between them. Even if you’re on our unique one Day Trip to Bahamas from Miami or any number of other Bahamas island hopping packages, the Schooner Cays are an absolute must-see. However, this is not the only beautiful scene you will enjoy on your Bahamas tour, each and every glorious beach bordered by the glistening Bahamian ocean is a truly sensational sight. Of course, you can island hop Bahamas by boat, but this experience is incomparable to exploring the islands from above. Not only do you get the exceptional views of the islands from your vantage point, you also have the chance to land and explore each island. Almost every island in the Bahamas is equipped with an airport or airstrip, which means that your day trip to Bahamas could take you anywhere. The convenience of a quicker travel time between islands is another factor to consider when Island Hopping Bahamas, allowing you to explore and experience more on your Bahamas tour. As if that wasn’t enough, a trip with Bahamas Air Tours guarantees you a window seat beside the larger than normal windows. This will allow you to make the most of the visual experience on your flights to Bahamas. The one thing that Island Hopping Bahamas will revive in you is the wonder and romance of flight. These days, in the soulless corporate world of flight, the majesty of flight has been forgotten. With Bahamas Air Tours you will find the thrill and unparalleled beauty of flight envelop you as you gaze down on one of the globe’s most stunning scenes. You won’t have to wait in queues through vigorous security checks, you won’t have to wait to board the plane. Island Hopping Bahamas means you can hop on and off the plane with each new island, immediately ready to explore. This accessibility is further enhanced for anyone in the USA, particularly if you live in Florida. The reason for this is that the island hopping Bahamas flight time from Florida is on about an hour, depending on whether you depart from Fort Lauderdale, Orlando or Palm Beach. Not to mention the convenience of all locals in the Bahamas speaking English and accepting US Dollars. A trip to the Bahamas would be incomplete without visiting some of the world-renowned beaches. In fact, many people enjoy Island Hopping Bahamas tours for the sole purpose of enjoying the marvellous coastlines. What many people don’t realize however, is that some of the beaches differ from the image of a sparkling white sandy beach beside the turquoise Bahamian ocean. Some beaches, in fact, display a vibrant pink hue, making your Bahamas tour an unforgettably unique experience. The pink colour of these beaches is due to the millions of microscopic mollusc shells that can be found in amongst the white sand granules. These shells emit an even brighter glow when wet, which is why the lower part of the beach is generally a more distinct pink. Though the shells may be red, when viewed the sand appears pink because of the white sand that blends with the red colour. There are several of these beaches in the Bahamas, all of which you can visit on an Island Hopping Bahamas tour. The most famous and popular of these beaches can be found on Harbour Island and is simply known as Pink Sands Beach. The Out Islands offer the authentic Bahamian experience, but among this string of islands you will find the Exuma Cays. Made up of 365 islands, the Exuma Cays display some of the most pristine and exquisite Bahamian islands. Several big Hollywood celebrities even own islands in the Exuma Cays. During your Island Hopping Bahamas tour you will come across an island known as Staniel Cay. This is one of the very best destinations to visit within the Bahamas, not only does it showcase some of the world’s most beautiful and untouched beaches, the surrounding waters are also home to some of the best attractions that the Bahamas have to offer. From Thunderball Grotto where the bond film “Thunderball” was shot, to the sunken wreck of a drug smuggler’s plane, a visit to Staniel Cay will bring you to some excellent sites. If exotic wildlife interests you, then nothing is better than the Staniel Cay Swimming Pigs. These delightful creatures will swim out to meet your boat when you pull into the bay where they reside. An Island Hopping Bahamas tour will not only introduce you to picturesque places and curious creatures, you will also have the chance to look through a window into the past. The Bahamas was the first place that Christopher Columbus made landfall on his voyage to discover the New World in 1492. San Salvador specifically holds the honour of being the first island for him to visit, but wherever you travel in the Bahamas you will find memorials and monuments in his honour. However, the Bahamas’ history goes even further into the past with artefacts and remnants of the native Arawak people. With a range of museums to visit on the island including some caves that the Arawak people called home, your Island Hopping Bahamas tour will be steeped in fascinating history. You may also take the time to visit some of the museums that discuss the history of pirates in the Bahamas. You will find exciting tales of Blackbeard the infamous pirate and his group known as the “Privateers Republic” who controlled Nassau for a short time in the 1700’s. Like any other destination, when you visit the Bahamas you delve into a new world and a new culture. With annual festivals celebrating the Bahamian culture, to local markets and Fish Frys where you can try some delicacies, your Bahamas tour will be a cultural extravaganza. While experiencing this culture you can also stay in some of the world’s best resorts, boasting luxury, romance and even family-friendly water parks to suit Island Hopping Bahamas travellers of all types. The Bahamas is also a hub of activity for sportsmen. A true Golfer’s and Boater’s paradise, the Bahamas allows you to let loose and enjoy your favourite sport in one of the world’s most picturesque settings. Fishermen, scuba divers, snorkel enthusiasts and free divers will also find a wealth of things to do in the Bahamas. The accessibility and convenience of a Bahamas tour cannot be overstated. Not only are you able to use US Dollars here, but the Bahamas flight time from Florida is only around an hour. Not to mention the exceptionally friendly english-speaking locals that will make your stay an unforgettable one. With Bahamas Air Tours you can visit this magnificent destination with a range of different packages. You can enjoy a multi day island hopping Bahamas tour, or a day trip from Miami, Fort Lauderdale and Orlando. Whether you plan to visit for some time and explore the islands, or enjoy a day trip with Bahamas Air Tours, you can choose to book private air charters and experience a private tour.